What’s more, in that brief moment I witnessed a wonderful picture of just how magnificent being a part of a truly global church can be. For though the ministry settings of the thirteen or so of us within the small group could not have been more varied–from a rural village in Angola, to a suburb in Switzerland, as well as a seminary classroom in Zimbabwe, and another in Dallas, and to congregations across the country, including a very special one in “the sweetest place on Earth” (Sugar Land, Texas, of course), there was clearly a commonality in our cause, namely, how might we get about the task of making disciples of Jesus that can actually change the world for the better? Ironically enough, however, the real collision of worlds here in Portland is not between the delegates from around the globe at our once-every-four-years gathering as a denomination. For those kinds of differences–linguistic or cultural–we can largely handle, thanks to a team of translators who are rendering the renderings into nine or so languages each day, as well as to the concerted efforts of many to be culturally sensitive at all times. And so far, at least, we’ve likewise been able to bridge the theological and political divides between the delegates, though we’ve not really engaged some of the more hot button issues yet. The greater disconnect, however, is between all of us church folks–no matter where we might live–and the surprisingly large street population of homeless youths and adults all around this beautiful city, as well as the many here who may be well-off but are yet far-off when it comes to the Christian faith. For it is obvious that those folks are not only unimpressed by all of our ecclesial pomp and circumstance, but they’re probably thinking that we are the ones who actually need help, at least in getting in touch with the real world around us. Oh, our marketing signs are everywhere, and truth be told they are good ones. For they center around the theme of what we can do when we are united, as the first word in our denominational name would infer. 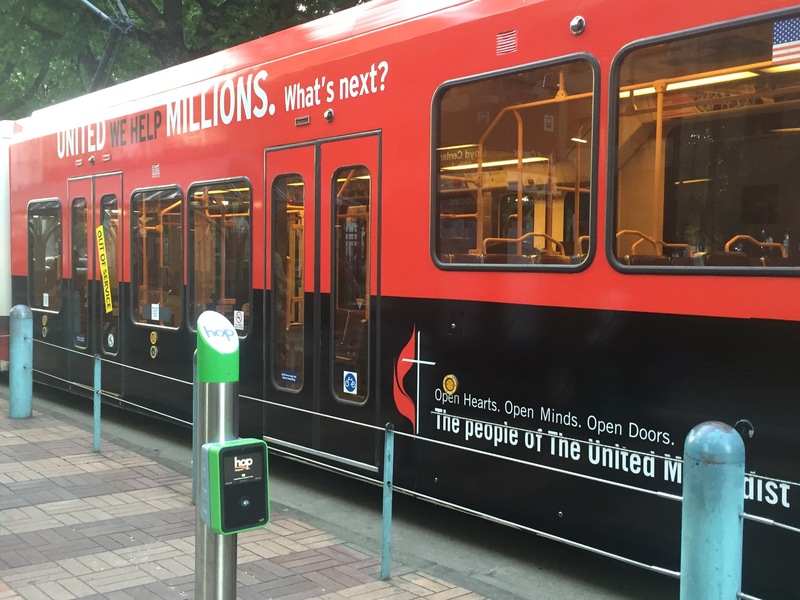 But to most of the folks who were stranded by a metro train that broke down–one ironically enough plastered with our new slogan,”United we help millions…what’s next?”–the symbolism of the police tape across its doors which read “Out of Service” was almost prophetic. For when we are not genuinely “in service” to others, we have no real witness to bring to them either. Thankfully the transit authorities were on the scene, rerouting buses and trying to get everyone around the bottleneck that shut down much of the whole system. To a person, in fact, the transit folks could not have been more courteous, kind or helpful, even in the face of a few commuters who were clearly upset by the delays in getting back home. I found myself imagining, however, just what a difference we too could make if we took the approach of the transit personnel, not only staying calm and helpful when confronted with angry neighbors but actually becoming proactive in seeking out those who might need assistance with whatever burdens of life they may be bearing. In fact you don’t even need Rosetta Stone to talk to those who may live in the world beyond our church doors. We just have to speak–or sing–the good news to them and then back it up with our tangible care and love. Good point, Chap. And, that’s exactly what those reaching out to the GLBT community are trying to do. Those who would wish to be ordained just want to be “of service” to their neighbors. Those who would wish to officiate at the marriage of their GLBT neighbors, affording them a blessing of a monogamous lifestyle and the chance to raise families within the Church, would wish to be “of service” too. For that’s how the early Christians grew the church. They sent Paul to the Turkish people because he was one of the Turks and could do better with the diaspora. They sent Barnabas to Cypress because he was from Cypress. Titus was in Crete because he was a Greek. We ordain people of color because they are better able to reach “people of color.” So, too, should we ordain those who can reach the GLBT community and heal the sins of the past. For, you have to wonder, how many other people have not sought ordination or even church membership, because they could not agree to live within such a judgmental group.